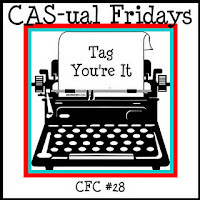 I made this tag for the current CAS-ual Fridays Challenge to make a tag and for the Hero Arts November Tag and Bling Challenge. The stamp is Hero Arts Winking Reindeer. Thanks for taking a look!! 5. Rhinestones - Queen & Co.
gorgeous i love this! and i am so obsessed with all the papers in that recollection stack, beautiful! Sweet tag! 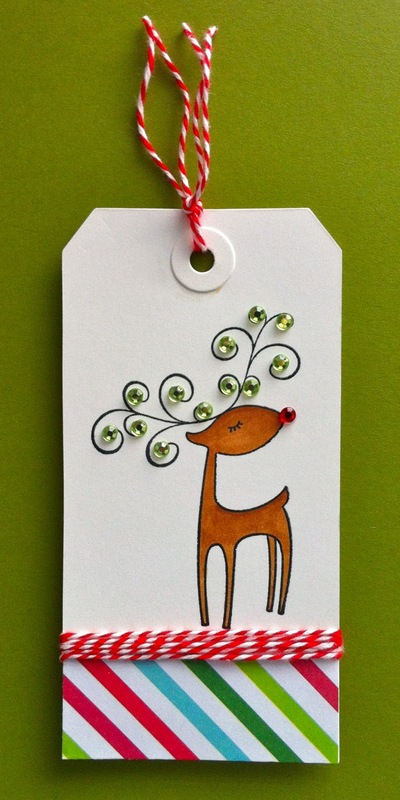 Love the striped paper and that adorable reindeer. Ann Y. This is such a cute tag! I love how you used the rhinestones on the antlers! Awesome, colorful tag! Love how you adorned his antlers. Your tag is simply so very eye-catching, Donna! Beautiful play with colors, twines and gems! Love it! Thanks so much for playing with us at CAS-ual Fridays! This is just too cute! Love the happy colors and the sprinkling of gems on this little guy!!! This is so cute, I love the bling! This is so stinkin' cute and uses one of my most fave Hero Arts images - love everything about this! OMGosh, that is an adorable tag! I love the image and everything you did with him!